Cleveland convened on the winding trail off West 65th again to try their hand at making it down on 3, 4 or more wheels. The 5th annual Big Race saw some beautiful weather for water balloons as diehard riders dared to dash down the drive. Head-to-Head matches in a race tournament for each category. 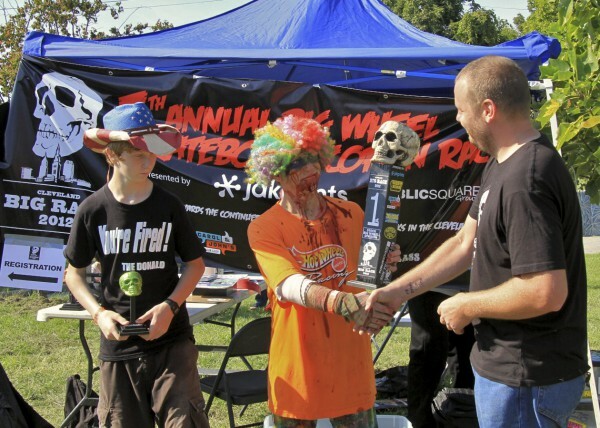 Winners get awesome trophies and a chance to defend their title each year. Big Wheels - Standard big wheels right off the retail shelf with 18 and over bodies on them. Skateboards - Coffin rides with hand pushing. Helmets, gloves and pads highly recommended! Open Division - Heavily modified Big Wheels or similar. Show-offs only. Skateboard Races are in the Coffin Ride form. No kneeling or sitting! Stock Big Wheels are normal big wheels from a toy store - no rubber tired big wheels or motorized tricycles. Open Division can be any type of wheeled custom ride on toy. No motorized stuff. Horns allowed.